You asked for it so here she is — the Natalya pattern. I will probably make a separate page for this later, but for now I’m just linking to the PDF. If you have any questions or problems don’t hesitate to ask. And if you do make up a pair and like them, let me know that too! Thanks for the pattern. Good luck with Paul’s sweater! Thank you for the pattern, It’s my next thing to cast on. Ooh thank you so much for the pattern! They are gorgeous and I can hardly wait to work them up. Oooh, love those gauntlets. Thanks for the pattern! I was biting my nails all weekend in anticipation. Thank you!!! Thank you so much!! I absolutely love these and they will definitley be one of my next projects! Thanks again! Thanks for being so nice to share your tallent with us. Its really great of you to share your pattern! 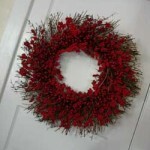 I will make some of these in the future! thanks! Hope to see a Paul sweater soon! Awesome! Thanks for sharing the pattern. I love your Gauntlets. They are beautiful! Thanks for the pattern. 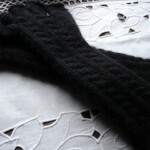 I will be making them as I have gotten so much use from my fingerless mitts that I have already made. Thank you for the pattern! I am going to make a pair for myself and a pair for my mom. very beautiful, I will try them after I get through a couple gifties. They look gorgeous, but the link doesn’t seem to be working? I’d love the pattern! DOH! I came into this post on a link from someone else’s blog – once I actually read your newer entries, I found the link to the pattern. Thanks for sharing the pattern, I am off to try it! Thank you so much for this pattern! I just finished a pair in blue stripes for my sister in law for Christmas and they turned out great. Thank you Thank you Thank you!!! I just started knitting in May and have become quite addicted to it. 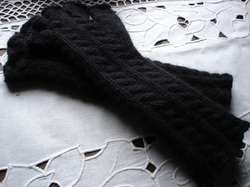 I just finished a wonderful scarf (Here and There Cables, Norah Gaughan) and decided to embark on the Natalya Gauntlets, which i’ve been wanting to try for a while now. Well i started it and i think it’s actualy looking great (What an AWESOME pattern! I can’t wait to wear it!) except for the fact that i might have screwed up the Gussett (I stopped here when i realized i didn’t have 15 stiches between markers). Would you mind if i emailed you some specific questions to try to figure out where i might be doing wrong? I wasn’t sure if i was following the gussett instructions correctly (I’m still learning to read patterns) but i decided to just keep going with it and see where it got me. (This has been my process with other projects…trial and error…this is the first time i got stuck enough that i’m reaching out for help.) HELP?? I made a pair of Natalya during the 2006 Olympics, and sent them to Kazakhstan. Now I’m making a pair for a friend. Do you want a photo? I’m making my second pair of Natalya, the version with short fingers. Where are the directions for the pinky finger? I can figure it out, but it seems they were there before. Hi! I am trying to find the Natalya pattern. The link doesn’t seem to work any longer. Thanks.